Place two goals in the center of the field one facing in one direction and the other facing the opposite way. Divide your players in half and have them start opposite each other with one team with the balls. If you have pinnies have your players wear them for clarity. With the younger age groups have the coach play the ball across, with the older age groups have the players themselves play the ball. 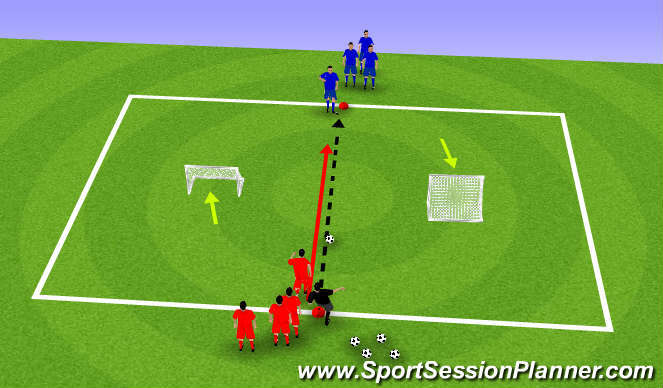 As the ball is going across the player closest to the coach (red) goes to try and defend the other team . The attackers (blue) can score in either of the goals. Once the ball goes out of bounds or in the goal the coaches plays the ball across to start the next 1v1 immediately. If the defender wins the ball they can also score in either goal.